The Thomson TO9 had a short career and was quickly replaced with the Thomson TO9 plus. It was designed to be a "super" Thomson TO 7-70 and has lost of its characteristics. Some options were available : RS232c and joystick connector, modem or genlock. 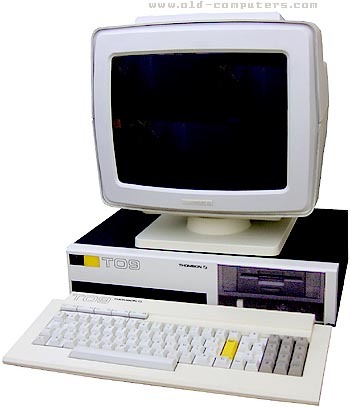 Notice that the very first version of the TO 9 (never marketed) had a 5.25" floppy disk drive. Contrary to the next Thomson series which have a sophisticated memory management, the TO 9 upper 64 KB ram are used as a ramdisk. It is provided with several utilities in ROM : two basics, a word processor (paragraphe) and a data base (fiche & dossiers), there were some problems with these utilities which couldn't be easy updated. see more Thomson TO 9 Ebay auctions !